WMAP Nine-year Paper Figures, Hinshaw, et al. 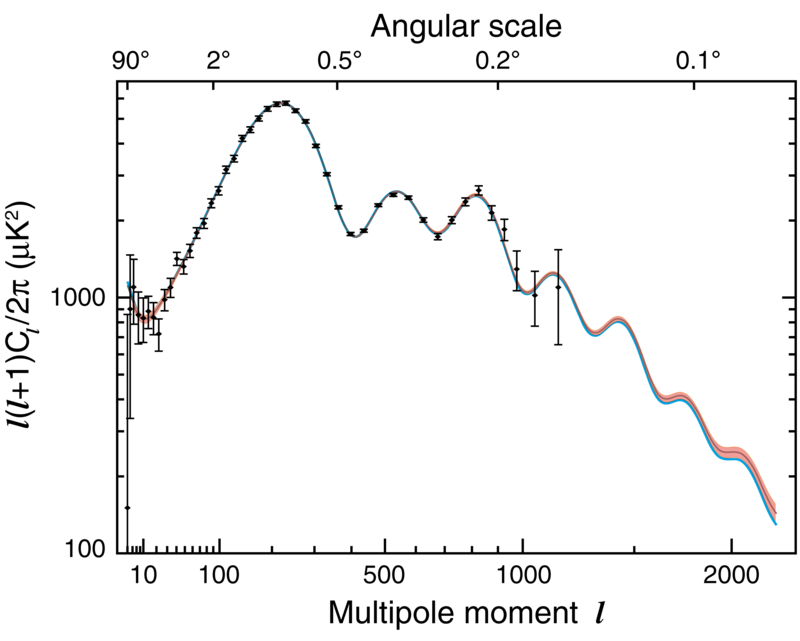 A compilation of the CMB data used in the nine-year WMAP analysis. The WMAP data are shown in black, the extended CMB data set - denoted 'eCMB' throughout - includes SPT data in blue (Keisler et al. 2011), and ACT data in orange, (Das et al. 2011b). 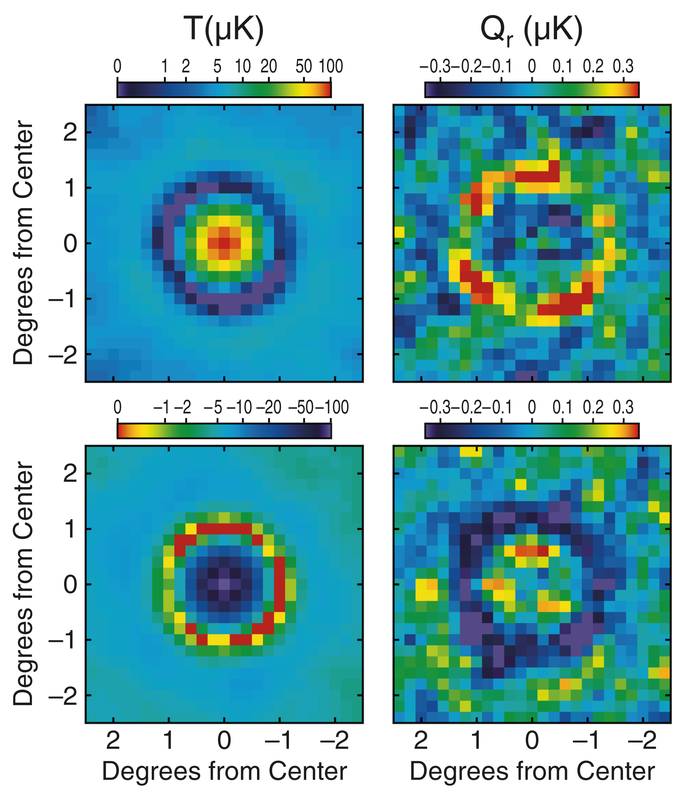 We also incorporate constraints from CMB lensing published by the SPT and ACT groups (not shown). The ΛCDM model fit to the WMAP data alone (shown in grey) successfully predicts the higher-resolution data. Two estimates of the WMAP nine-year power spectrum along with the best-fit model spectra obtained from each; black - the C-1-weighted spectrum and best fit model; red - the same for the MASTER spectrum and model. The two spectrum estimates differ by up to 5% in the vicinity of l ~ 50 which mostly affects the determination of the spectral index, ns, as shown in Table 3. We adopt the C-1-weighted spectrum throughout the remainder of this paper. 68% and 95% CL regions for the ΛCDM parameters ns, 109Δ2R, and Ωbh2. There is a modest degeneracy between these three parameters in the six-parameter ΛCDM model, when fit to the nine-year WMAP data. The contours are derived from fits to the C-1-weighted power spectrum, while the plus signs indicate the maximum likelihood point for the fit to the MASTER power spectrum. As shown in Figure 2, the two model produce nearly identical spectra. 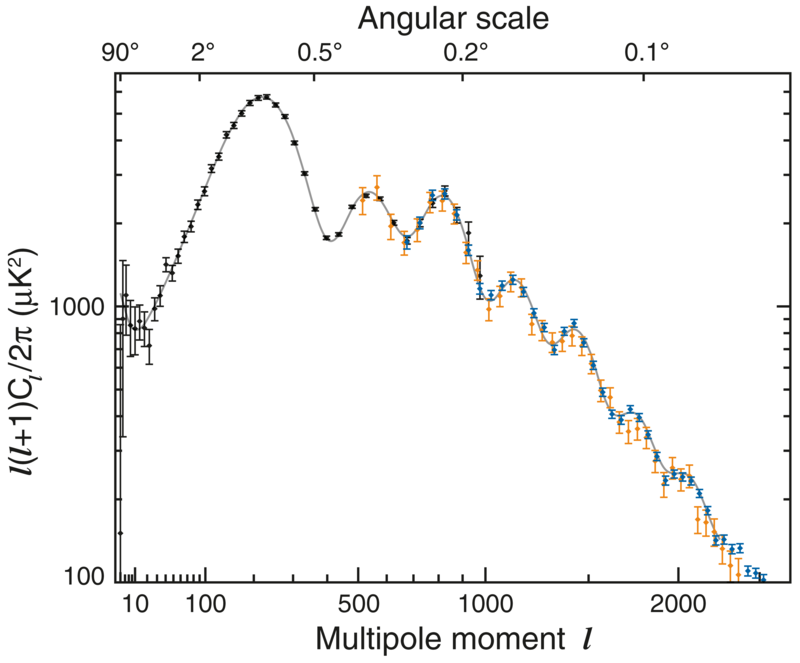 Measurements of the scalar spectral index with CMB and BAO data. Left to right - contours of (DV (0.57)/rs,ns), (H0,ns), (Ωch2,ns). Black contours show constraints using WMAP nine-year data alone; blue contours include SPT and ACT data (WMAP+eCMB); red contours add the BAO prior(WMAP+eCMB+BAO). The BAO prior provides an independent measurement of the low-redshift distance, Dv(z)/rs, which maps to constraints on Ωch2 and H0. 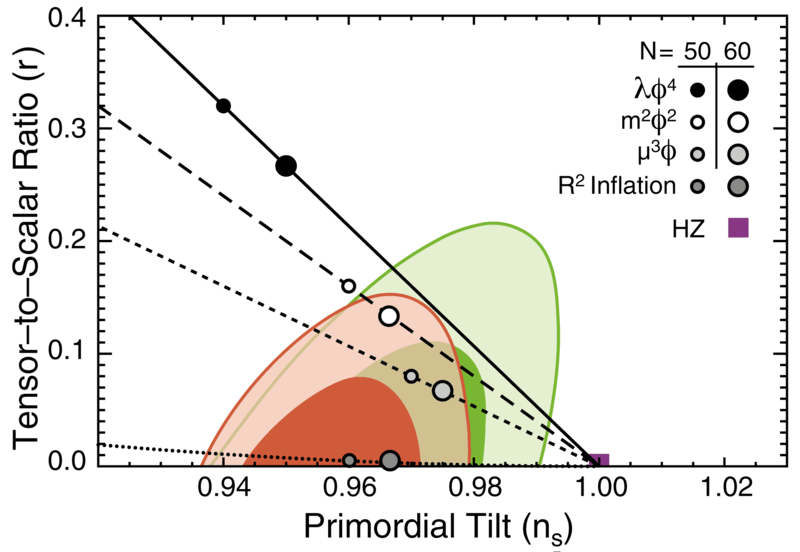 When combined with CMB data, the joint constraints require a tilt in the primordial spectral index (ns< 1) at the 5σ level. Measurements of Ωch2 and H0 from CMB data only (blue contours, WMAP+eCMB), from CMB and BAO data (green contours, WMAP+eCMB+BAO), and from CMB and H0 data (red contours, WMAP+eCMB+H0). 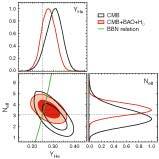 The two non-CMB priors push the constraints towards opposite ends of the range allowed by the CMB alone, but they are not inconsistent. 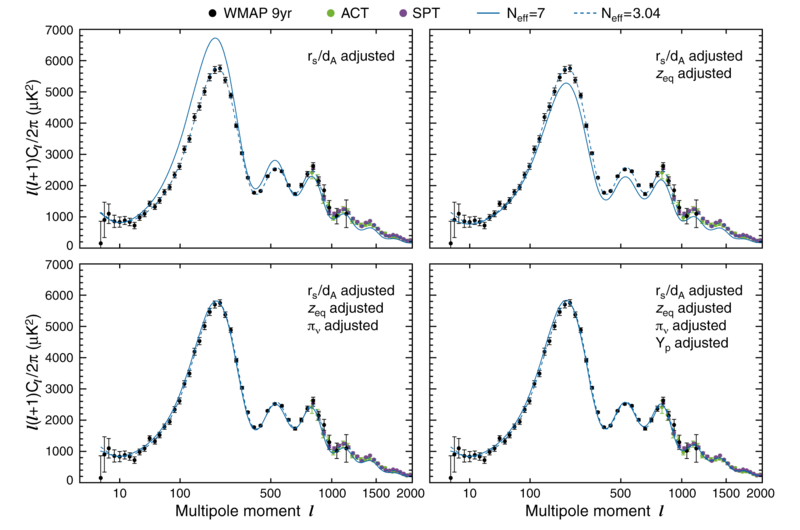 The nine-year WMAP data (in black) are shown with the 1σ locus of six-parameter ΛCDM models allowed by the nine-year WMAP data. The error band is derived from the Markov Chain of six-parameter model fits to the WMAP data alone. The blue curve indicates the mean of the ΛCDM model fit to the WMAP+eCMB data combination. At high-l this curve sits about 1σ below the model fit to WMAP data alone. The marginalized parameter constraints that define these models are given in the WMAP and WMAP+eCMB columns of Table 4. 4 potential (Komatsu & Futamase 1999). See Appendix A for details. 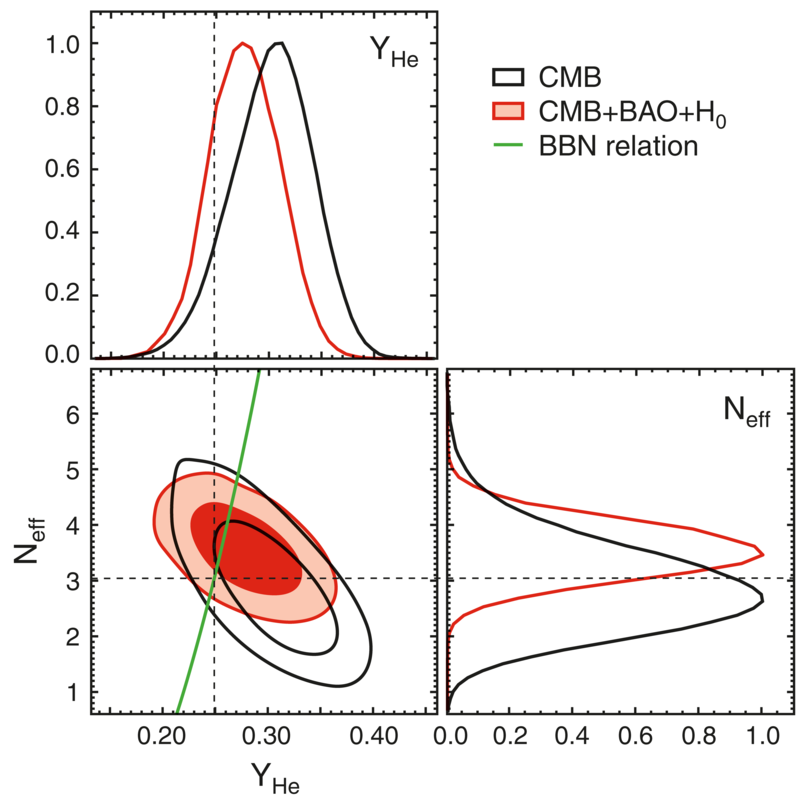 An illustration of four effects in the CMB anisotropy that can compensate for a change in the total radiation density, ρr, parameterized here by an effective number of neutrino species, Neff . The filled circles with errors show the nine-year WMAP data (in black), the ACT data (in green, Das et al. 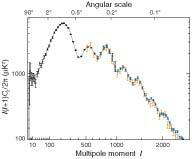 2011), and the SPT data (in violet, Keisler et al. 2011). The dashed lines show the best-fit model with Neff = 3.046, while the solid lines show models with Neff = 7 with selected adjustments applied. (The other parameters in the dashed model are Ωbh2 = 0.02270, Ωch2 = 0.1107, H0 = 71.38 km/s/Mpc, ns = 0.969, Δ2R = 2.384 × 10-9, and τ = 0.0856.) Top-left: the l-axis for the Neff = 7 model has been scaled so that both models have the same angular diameter distance, dA, to the surface of last scattering. Top-right: the cold dark matter density, Ωch2, has been adjusted in the Neff = 7 model so that both models have the same redshift of matter-radiation equality, zeq. 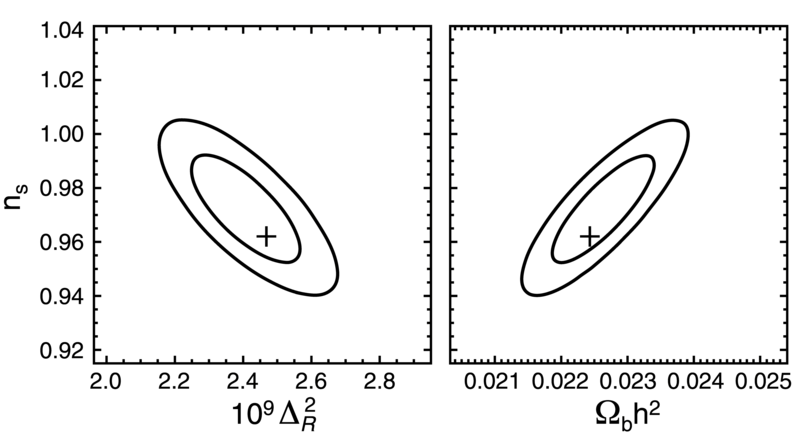 Bottom-left: the amplitude of the Neff = 7 model has been rescaled to counteract the suppression of power that arises when the neutrino's anisotropic stress alters the metric perturbation. Bottom-right: the helium abundance, YP , in the Neff = 7 model has been adjusted so that both models have the same diffusion damping scale. Joint, marginalized constraints (68% and 95% CL) on the primordial helium abundance, YHe, and the energy density of "extra radiation species," parameterized as an effective number of neutrino species, Neff . 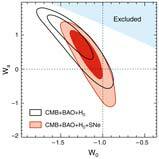 These constraints are derived from the nine-year WMAP+eCMB data (black), and from WMAP+eCMB+BAO+H0 data (red). The green curve shows the predicted dependence of YHe on Neff from Big Bang Nucleosynthesis; the dashed lines indicate the standard model: Neff = 3.046, YHe = 0.248. 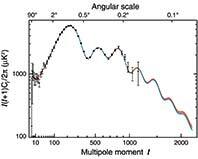 The joint, marginalized constraint on w0 and wa, assuming a flat universe. A cosmological constant (w0 = -1, wa = 0) is at the boundary of the 68% CL region allowed by theWMAP+eCMB+BAO+H0+SNe data, indicating that the current data are consistent with a non-evolving dark energy density. The shaded region is excluded by a hard prior, wa < 0.2 - 1.1w0, in our fits. 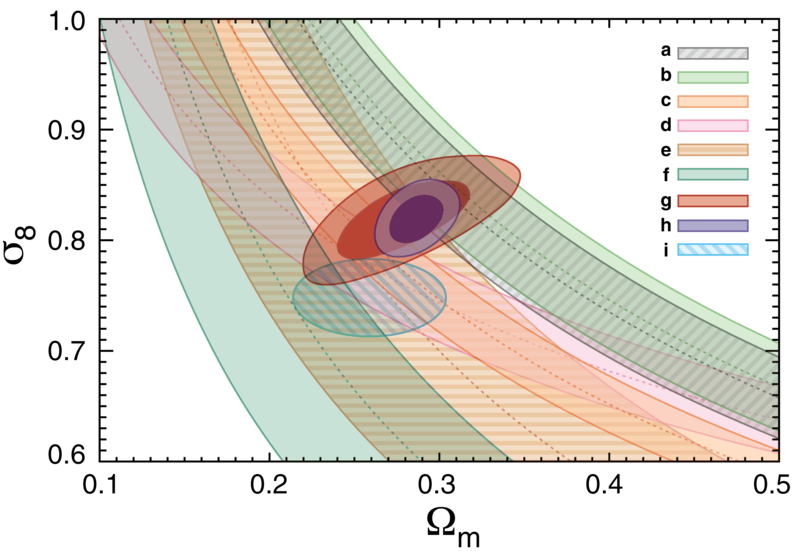 A compilation of the (Ωm, σ8) constraints from large scale structure observations, discussed in §5, compared to the constraints obtained from CMB, BAO, and H0 data. 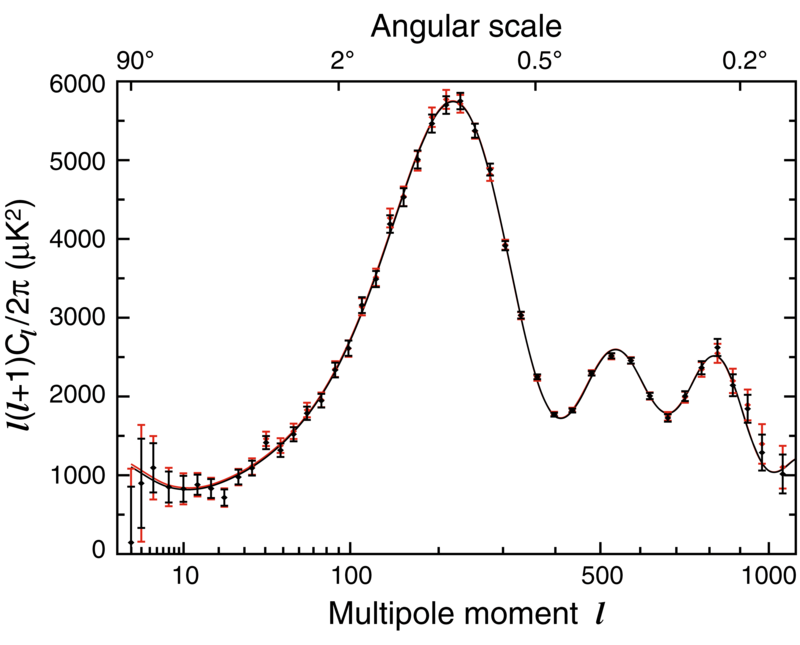 The various large scale structure probes do not separately constrain the two parameters, and have somewhat different degeneracy slopes among them, but these independent measurements are quite consistent. The following 1σ regions are plotted: (a) σ8Ω0.5m = 0.465 ± 0.026 from Tinker et al. (2012); (b) σ8(Ωm/0.325)0.501 = 0.828 ± 0.049 from Zu et al. (2012); (c) σ8(Ωm/0.25)0.47 = 0.813 ± 0.032 from Vikhlinin et al. (2009b); (d) σ8(Ωm/0.25)0.3 = 0.785 ± 0.037 from Benson et al. (2011); (e) σ8(Ωm/0.3)0.67 = 0.70+0.11-0.14 from Semboloni et al. 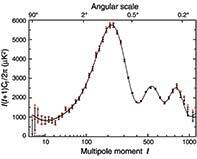 (2011); (f ) σ8Ω0.7m = 0.252+0.032-0.052 from Lin et al. (2012); (g) WMAP only; (h) WMAP+eCMB+BAO+H0; (i) ellipse whose major and minor axes are given by Ωm = 0.259±0.045 and σ8 = 0.748±0.035 from Hudson & Turnbull (2012). Co-added maps of temperature, T, and polarization, Qr, smoothed to a common resolution of 0.5°, and stacked by the location of temperature extrema. (The polarization maps were not smoothed for the analysis, however.) Top-left: the average temperature hot spot. Top-right: the rotated polarization map, Qr, stacked around temperature hot spots. Bottom-left: the average temperature cold spot. Bottom-right: the rotated polarization map, Qr, stacked around temperature cold spots. The polarization images are color-coded so that the red (Qr > 0) shows the radial polarization pattern, while blue (Qr < 0) shows the tangential polarization pattern. The lines indicate polarization direction. 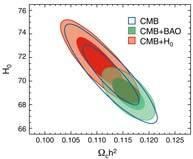 These images are a striking illustration of BAO in the early plasma, and phase coherence in their initial conditions.